We’ve never had a decline in house prices on a nationwide basis. So, what I think what is more likely is that house prices will slow, maybe stabilize . . . .
A few years ago, the very idea of falling home prices appeared to be incomprehensible to the elite coterie of policymakers who created the housing boom and bust. The reality, when it hit, caused financial panic and drove the banking system and millions of households into insolvency. Yet now, monthly reports of a renewed decline in real estate values are met with what-me-worry carelessness. 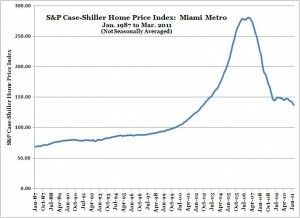 So there will probably be no panic over the latest S&P Case-Shiller Home Price Index, which showed that (yawn) home prices fell again in Miami for the three-month period ending March 2011. 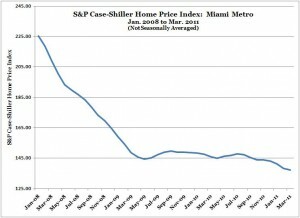 The good news is that the rate of decline in Miami home values moderated from last month’s reading, and the current dip is not the sort of steep decline exhibited during the crash phase of the real estate collapse. On the other hand, the long view does not give any clear indication of where the bottom will be, now that we have broken the previous low from spring 2009. Continued price declines will eventually combine with wage gains to put in a bottom for real estate prices in the Miami metro area (including Coral Gables). For now, the data show that Mr. Market is still working his way to the downside. There may be specific neighborhoods, price ranges, and most important, individual transactions (houses or condos) for which the risk is low enough to justify buying real estate despite falling values in the broader market. Otherwise, it remains a dubious financial undertaking to buy a depreciating asset with borrowed money. Fountain at Portofino condominium, 300 South Pointe Drive, in the SoFi (South of Fifth) neighborhood of South Beach in Miami Beach. Looking to build your dream home in the estate areas of Miami and Coral Gables that lie south of Sunset Road (SW 72 Street) and east of South Miami? Several of the lots listed for sale in the estate neighborhoods of High Pines, Ponce-Davis and Hammock Lakes have recently either sold or gone pending. 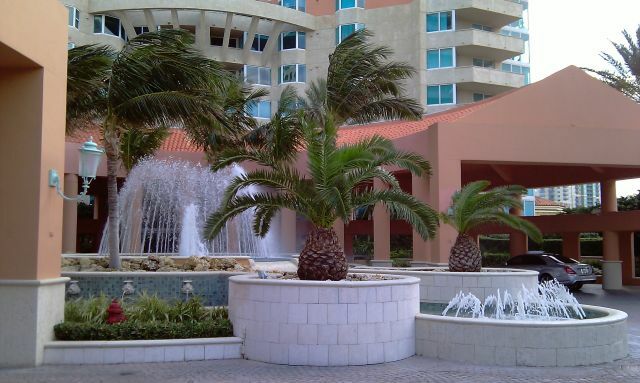 The property at 5490 Hammock Drive in Coral Gables sold for $1.25 million. It’s in the soon-to-be-gated Hammock Lakes neighborhood. Two other lots, each about one acre and listed for about $1 million, went pending in the High Pines / Ponce-Davis neighborhood of Miami. There wasn’t much buildable land in the first place, and it just got a bit more scarce.